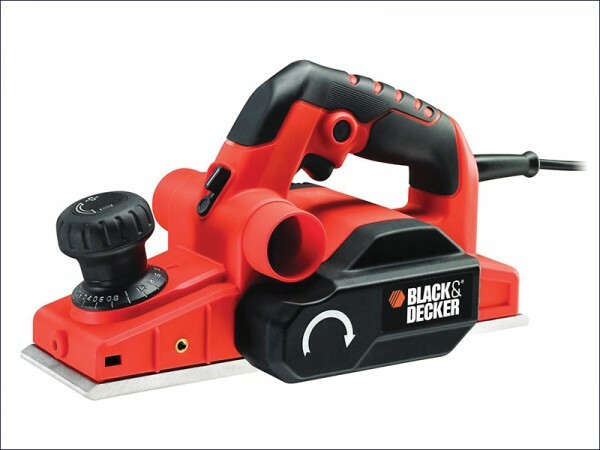 he Black & Decker KW750K is a robust and powerful electric planer. Its 750W motor provides smooth results, even in hard wood and at the maximum depth of cut. 2 high quality reversible TCT blades ensure maximum life and a superior finish. The choice of left or right hand chip ejection makes the planer more comfortable to use, and the easy to empty dust bag makes for a cleaner working environment. The 2mm depth of cut ensures a large amount of wood can be removed in one pass, whilst the minimum 0.2mm depth of cut setting makes for increased accuracy. A 12mm maximum rebate depth broadens the applications the planer can be used for, and the 3 different sized chamfer grooves allow for easy and precise shaping of wood. The park rest feature protects both the work piece and the blades and the inclusion of a side fence means more control and accuracy. Over mould on front and main handle gives a better grip for both comfort and control. Usage: Easing doors and windows. Depth of Cut: 0 - 2.0mm. Supplied with a dust bag, parallel fence, vacuum adaptor, spanner and kit box.